Polypipe Ridgicoil Gas Pipe Ducting is a PVCu single wall perforated duct for providing gas pipe protection within gas applications. The gas pipe duct is manufactured to BS 4962 standards and the perforations allow for gas to safely vent in the event of a leak. Polypipe’s Ridgicoil Gas Pipe Ducting is available in two outer diameter sizes of 60 and 100mm, in lengths of 25m, 50m and 150m and is supplied with an integral coupler. Northern Gas Network guidelines state that gas pipe ducting must be yellow in colour, perforated, vented appropriately and must comply with BS 4962. The internal diameter must allow for sufficient room around the gas pipe without damage – for 32mm gas pipes the minimum duct size is 60mm and for 63mm gas pipes the minimum duct size is 100mm. Local regulations and utility specifications vary – contact us to discuss your application. 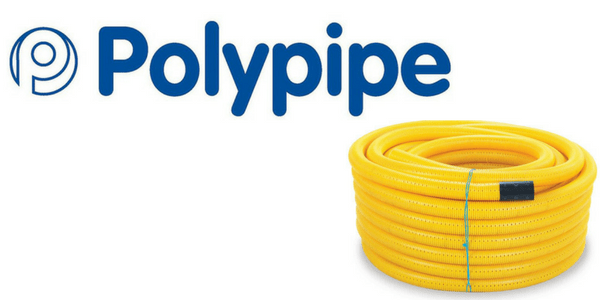 Polypipe’s Ridgicoil gas pipe duct is compliant with BS 4962 which is a British Standard specification for plastics pipes and fittings for use as subsoil field drains. BS 4962 specifies the requirements, dimensions, materials and performance for plastic pipes in sizes of up to 400mm diameter used for subsoil drains and corresponding unperforated system links. T&D also supply a full range of cable protection products. T&D distribute Cable Protection Solutions including concrete cable troughs, Tapetile and Stokbord cable covers.